Dubai's Roads and Transport Authority (RTA) has completed construction works on the two main bridges at the intersection of Marrakech Road and Airport Road and will phase their opening in two stages. The first stage will see the existing traffic movement incoming from Sheikh Mohammed bin Zayed Road and Al Khawaneej heading to Deira permanently diverted to the new three-lane bridge on March 23. RTA will close the parallel bridge serving the traffic coming from Deira in the direction of the Sheikh Mohammed bin Zayed Road and Al Khawaneej pending the completion of works at the entry of the bridge and other construction works. The second bridge will be open for traffic on March 30. The ramp leading to Airport Terminal 3 will be opened by the end of April 2018. Engineer Maitha bin Adai, CEO of RTA’s Traffic and Roads Agency, said: “The improvement of Marrakech-Airport roads junction includes the construction of two bridges on the Airport Road comprising three lanes in each direction. Works also include constructing a ramp from the bridge leading directly to Terminal 3 of Dubai International Airport without waiting at the traffic signal. 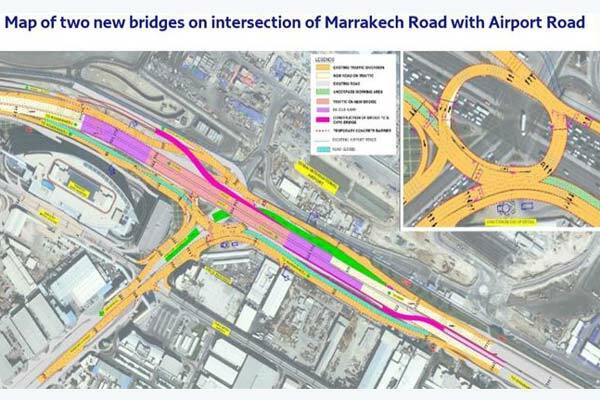 The project also includes the construction of a two-lane underpass to serve the traffic heading leftward from the Airport Road in the direction of Marrakech Road. The project will substantially reduce the waiting time at the intersection. “The Airport Road Improvement Project also includes the construction of four junctions. Al Rashidiya intersection will be upgraded through the construction of two bridges on the Airport Road comprising three lanes in each direction. The intersection of the Airport-Nad Al Hamar roads will be upgraded by constructing a two-lane ramp to serve the traffic coming from Nad Al Hamar Road in the direction of the Airport Road. This will ease the existing tailbacks generated by the overlapping traffic at Nad Al Hamar intersection between the first circular slope heading leftward from Nad Al Hamar Road to the Airport Road, and the second circular slope heading leftward from the Airport Road to Nad Al Hamar Road," Maitha bin Adai said. It also includes upgrading the intersection of the Airport–Casablanca roads through the construction of an additional single-lane ramp to serve the traffic from the Airport Road in the direction of Casablanca Road, thus eliminating the waiting time at the signal. It also includes the construction of an alternative route for traffic inbound from Al Garhoud, thus enabling direct access to Terminal 1 and 3 of the Dubai International Airport, besides increasing the number of lanes of Casablanca Road in the direction of Al Garhoud from three to four lanes. The project will considerably reduce the total waiting time at Casablanca Intersection, and ease the existing tailbacks generated by the overlapping traffic between vehicles heading towards Casablanca Intersection and others coming from Terminal 1 heading leftwards to Casablanca Street. The Improvement of the Airport Street Project is part of RTA’s plan for accommodating the accelerated growth in the number of passengers of Dubai International Airport, which is expected to hit 92 million by 2020. Upon completion, the project will increase the capacity of the Airport Road by as much as 5,000 additional vehicles per hour. It will also boost the traffic safety level, and cut short the transit time on the Airport Road.